How do I add scripts to my Stealthbot? As some of you may have noticed, Stealthbot is focusing more on creating scripts as opposed to plugins. This means that when you first download the bot, you don't need that extra step to download the Plugin System in order to run your scripts. These are the methods for saving scripts after you've just installed your Stealthbot. Remember: You do not need to install the Plugin System! First, you MUST use the Launcher application to create a new profile. From there, launch the bot. 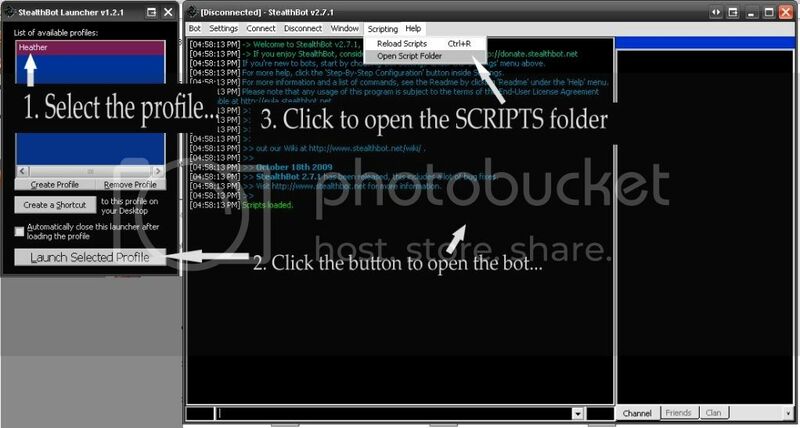 Now, when you go to the Scripting drop down menu from the bot console and click the " Open Scripts Folder ", you will be taken to the location of the scripts folder. All scripts should be saved in this location and will belong to the specific profile. Say you were to make two different profiles, "Bot1" and "Bot2" and you load the CRS into Bot1's profile. When you start Stealthbot using the Bot2 profile, the Stealthbot will not have the CRS script because the script was not inserted into that profile's script folder. All your scripts are to be saved in that script folder, not the default program files one. Sometimes, if you copy code within the code tags, you might lose all the formatting and indenting, which is just messy, or sometimes have it all jumble up together, which is really not good, so here's what you do. Move down to the lower-right edge of the code post and click the " Reply " button. Now you have all the code with the proper formatting inside the code tags. The code you want is in between those code tags. Highlight the code in between the code tags, hold CTRL, press C to copy the code, release CTRL. Open up Notepad or whatever text editor you like to use. Hold CTRL, press V to paste the code, release CTRL. Go to your bot window, click the Scripting drop down menu and click Reload Scripts. Alternatively, you can hold CTRL, press R, and release CTRL as a shortcut to reloading the scripts manually. Simply select all the code in the post. Hold CTRL, press C to copy the code, release CTRL. Click the attachment so that it opens up into a new browser window. Go to File > Save Page As, then save the file as a txt file into your /scripts folder. Right click the attachment link, choose Save Link As, save it as a txt file into your /scripts folder. Then reload the scripts on your bot after you have the script saved. Note: When viewing code in your browser by clicking on the attachment links, occasionally, with Internet Explorer users, the code will appear smashed and jumbled all together. This isn't because the code was posted wrong, this is due to a browser issue and you should not save the code using Method 1. Instead, save the code using Method 2.